Geography/Culture: Africa. Yoruba of Nigeria. Description: Mother Goddess of the Niger River, wind, rain, fertility and divination; She Who is manifest in the strong winds preceding a thunderstorm, and Who is manifest in heavy rainstorms; She Who goes before the lightning; She Whose coming annouces to Her people the approach of Her consort; She Who blows roofs off houses, knocks down large trees, and fans the fires set by Her consorts thunderbolts into high blaze. To Whom Sacred: horns of the African buffalo, or bush-cow (which are kept in Her shrines); throat disease (She fights with worshipers who have offended or neglected Her, by so afflicting them); polished stone celts (they resemble the thunderstones of Shango, ----, but their cutting edges are not so sharp); strings of tubular maroon beads worn around the neck (an insignia worn by Her worshipers); sixteen cowrie shells (used in Her divination procedures). Her sacrificial foods include plantains; brown beans; mashed corn; she-goats; castrated he-goats; hens. Taboos: rams; ewes; no one may smoke or have a fire in Her shrine or in front of one of Her worshipers. Male Associates: Consort: Shango, ----, the storm god. She is his most loyal consort. Without Her, he cannot fight. 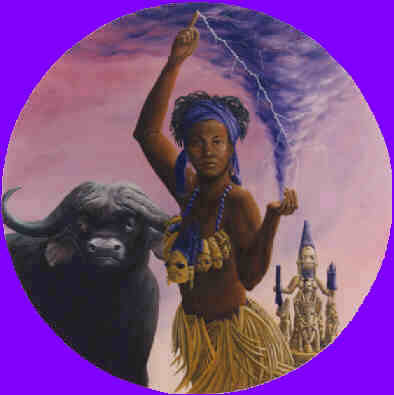 Oshun, ----, Who taught Oya, She-Tore, (and others) the art of divination, also has Shango, ----, as Her consort. Source: B,W.YSN/87-8, 90; G,P.LWM/533, 535.
worked on: August, July, June 1995; August 1991.